The evolution of the world may be compared to a display of fireworks that has just ended: some few red wisps, ashes and smoke. Standing on a cooled cinder, we see the slow fading of suns, and we try to recall the vanished brilliance of the origin of the worlds. With the 2011 Nobel Prize in Physics going to three cosmologists, it seems appropriate to explore what the consensus is in modern cosmology. This is the first of a series of posts covering what we understand about our universe, using a particular viewpoint: a very large cubic box. By studying the contents of this box, how it changes in time, and how it relates to other, similar boxes, we can comprehend much of modern cosmology within a simple framework. Draw a large cubical box with Earth at its center, but with sides very far from us, far enough that the motion of the Sun around the galactic center is tiny. We’re trying to contain enough of the Universe that if we moved the cube to another location, the contents would be about the same on average: roughly the same number of galaxies, galaxy clusters, stars, and so forth. At the same time, we don’t want it to be too big: if it’s too large, then you run the risk of encompassing the entire observable universe, which adds complications of different kinds. 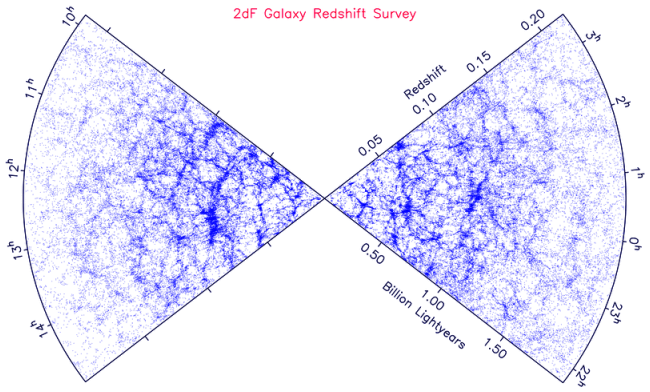 The 2-degree Field (2dF) galaxy survey by the Anglo-Australian Observatory counted all the galaxies in a 2-degree swath of the sky. (For comparison, the Moon is about 1/2 degree wide.) Each purple dot is a galaxy, so you can see that with a large enough box, the universe looks fairly smooth, even though it decidedly is not on smaller scales. The specific size of the cube isn’t that important, but let’s just say it’s more than 100 million parsecs across, meaning it would take light hundreds of millions of years to cross from one side to the other. A typical cube of this size will contain several galaxy clusters, each of which may have hundreds or thousands of galaxies. That’s what our first census will see inside the box: galaxies, whose light is from stars. Human eyes are tuned to a narrow part of the whole spectrum of light, which is ideal for seeing those stars. 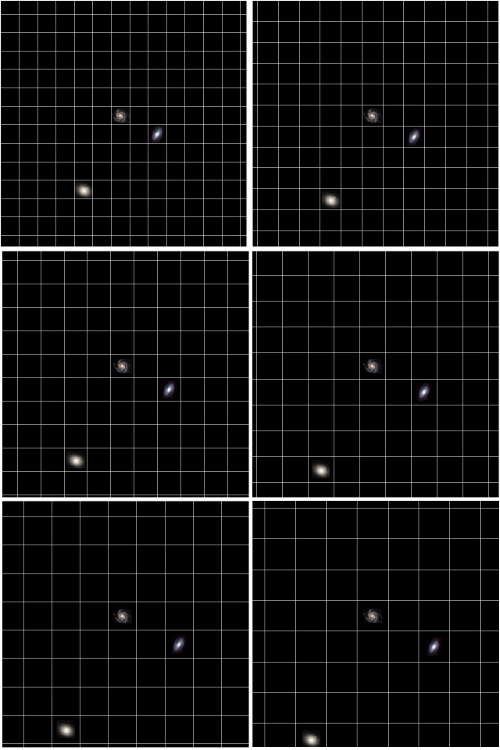 Changing the type of light would show a different view: infrared will still show the same galaxies; ultraviolet will preferentially pick out spiral arms in younger galaxies; in X-rays, stars are faint, replaced in our view by glowing blobs of hot gas in clusters and even more intense concentrations around supermassive black holes at the hearts of the galaxies. By combining all types of light, we form a picture of where most of the ordinary matter – atoms of the same types in our bodies – lies. However, that’s not all: if we look not just at the light but at the motions of stars and galaxies, we notice that there simply isn’t enough mass from ordinary matter. This missing stuff is known as dark matter, and it clumps up where the galaxies and clusters are, but there’s a lot more of it. A typical galaxy will have 10 times more dark matter than ordinary matter; a galaxy cluster will be 85% dark matter apart from the extra dark matter within the galaxies. We should also count the light itself: a lot of energy is contained in photons from the stars and other sources. As with the split between ordinary and dark matter, there is another source of light we don’t see with our eyes: our box contains more than 10,000 times more photons left over from the early universe than have been produced by stars. Those photons originated when the universe became transparent, about 380,000 years after the Big Bang; they fall into the microwave portion of the spectrum, and are known as the Cosmic Microwave Background (CMB). As far as our cosmic box is concerned, they just are there, and must be counted in the census. Because the CMB photons so vastly outnumber photons from all other sources, we can pretend the total amount of light is unchanging in time, even though stars are constantly pumping out more of them! A cosmic cube, with sides 500 million light-years long. Each face is part of the 2dF survey, so each yellow blob represents a real galaxy. 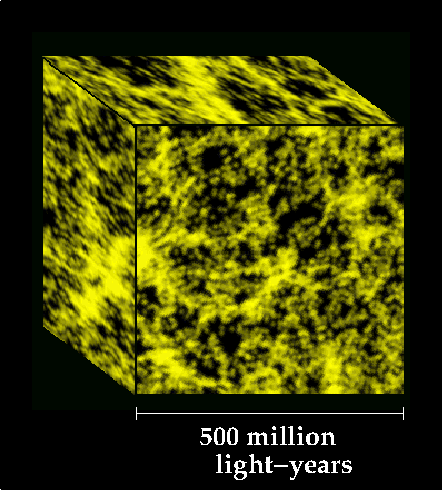 With a cube this large, you can begin to see why cosmologists claim the universe is homogeneous: the cube is fairly uniformly yellow. If we split the universe into identical cubes of this vast size, each cube will look more or less the same, whether it is near us or far away. (This is also why I picked a cube rather than a more natural shape, like a sphere: you can cover the whole universe with cubes without overlapping or leaving empty spaces.) That each cube has the same density of stuff (matter, light) means the universe is homogeneous: the lumps are much smaller than the boxes containing them. That each cube in general looks the same whichever way you travel means the universe is isotropic. Together, these properties comprise the cosmological principle, which is an extension of the idea that our place in the universe is typical of the whole cosmos. We are not the center of the universe, and in fact there is no center: if there was a center, then some of the boxes would be special, different in some way from the others. We don’t see this in our observations, so the cosmological principle seems to describe our universe as it is. An etymological digression: milk that comes out of a cow has a layer of fat on the top. Homogenizing it mixes the fat throughout, so homogeneous means the mixture is smooth. Also, recall from geometry class that an isosceles triangle has two legs of the same length, and an isometric workout exercises your whole body; iso- indicates sameness. The Greek word tropos indicates turning: a heliotrope is a plant that turns toward the Sun (helios in Greek); this is also the root of the word “tropics”. Thus, homogeneous and isotropic means the lumps in the universe are small compared to the size of the universe, and the universe will look the same whichever direction you turn. You might be thinking to yourself, “Wait, Dr. Francis, photons move really fast! How can you talk about the box containing them?” My response: you can call me Matthew because we is pals. And the nice thing about every box being similar is that each time a photon (or gas atom or dark matter particle) leaves a particular box, on average another one will enter. In fact, you can even pretend that each box has perfectly reflecting walls; either way, the total amount of stuff within each box will remain more or less constant over time. During the 1920s, Vesto Slipher and Edwin Hubble discovered that galaxies appear to be moving away from us; the farther those galaxies are, the faster they are receding. Ruling out again the idea that we’re in a special place, we must conclude that on average every galaxy is getting farther apart from every other galaxy. I say “on average” because if two galaxies are very close together, their mutual gravity will pull them closer and they might actually merge into one. The Milky Way and its largest neighbor, Andromeda Galaxy, are moving toward each other, but almost every other galaxy we see is moving away from us. Here’s another way to think about it: the boxes I described are getting larger as time progresses. They are large enough that stuff inside them can go on more or less normally: gravity extends a long way, but it gets weaker the farther apart two masses are. A galaxy on one side of the box won’t affect one on the other side strongly enough to make a difference. (Besides which, the influence of gravity propagates at the speed of light, so the huge separation means hundreds of millions of years pass between a cause in one galaxy and its effect in the other.) Galaxies aren’t getting bigger; we aren’t getting larger. The box is growing larger, therefore, even though its contents are staying the same size. This is what expansion of the universe means. A large group of cosmic boxes packed together. I only included three galaxies and made them far too big for simplicity's sake. The galaxy closest to the center represents the Milky Way (our frame of reference). As time progresses, each box grows larger but the galaxies don't; because each galaxy is "attached" to its own box, they all get farther apart as the cubes grow. The farther galaxy appears to be moving faster with respect to us simply because more cubes lie in between us and it. The picture above is from the Milky Way’s perspective; the picture below is from the perspective of the galaxy at the lower left. When you use the cosmic box approach, you can see that observers in every galaxy will measure cosmic expansion in the same way. The same frames as the previous image, but this time viewing from the point of view of the lower-left galaxy. The boxes are expanding at the same rate as before; the picture only looks different because of our change in perspective, not because anything about the universe itself has changed. Observers in any galaxy will see every other galaxy moving away. 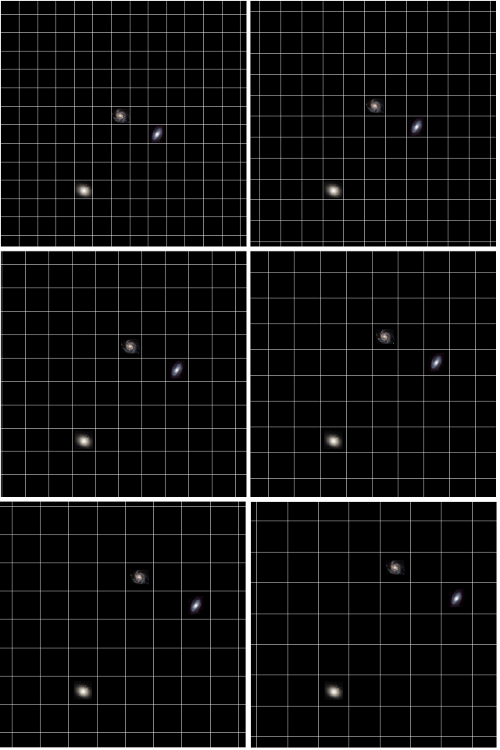 The two graphics below animate the expansion examples described above. Click each image to see the animation in a larger size. We’ve established a way to understand the structure of the universe on very large scales, including some of the major contents. We also have a fairly straightforward way to understand cosmic expansion. In the next installment of “The Universe in a Box”, we’ll see how the contents of the universe affect expansion, and put in that all-important missing piece: dark energy.